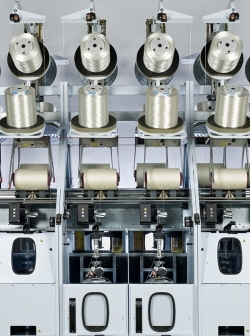 Twisting solutions specialist Saurer will present a number of improvements to its Allma CableCorder product range of tire cord cabling machines. The new features all aim to lower energy consumption while maintaining quality, using carefully designed components and intelligent software solutions. One of the headline improvements is Saurer’s adaptation of the spindle pot to the physical geometry of the thread balloon to conserve energy.